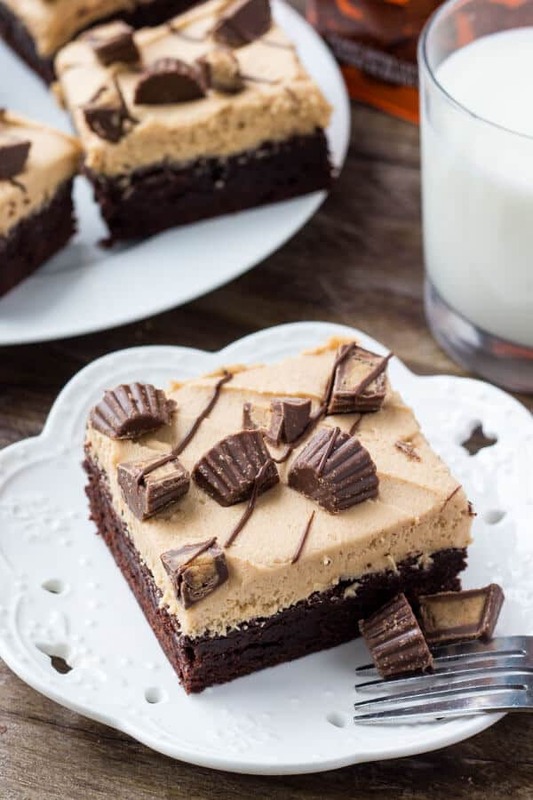 If the idea of fudgy brownies with peanut butter frosting sound right up your alley – then you’re going to love these chocolate peanut butter brownies. 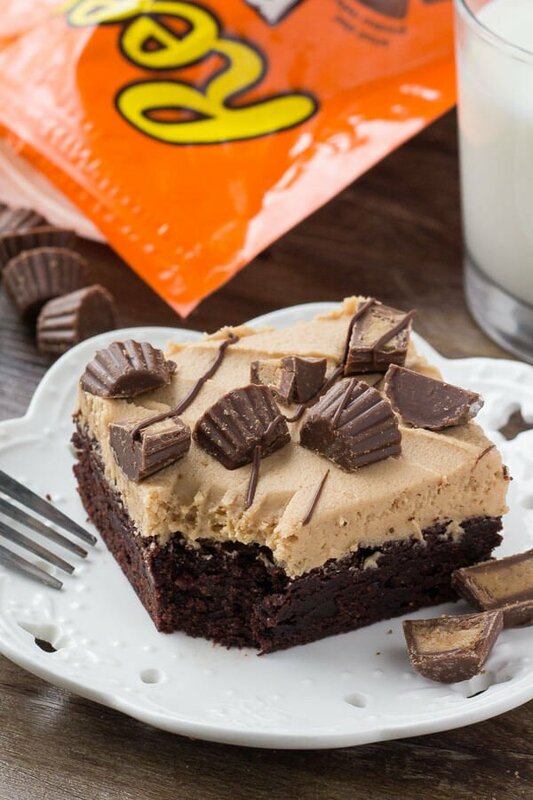 These chocolate peanut butter brownies are the perfect way to combine my 2 favorite things. The brownie is fudgy, dense deliciously chocolate-y, and made in only 1 bowl. Then it’s topped with creamy peanut butter frosting that’s the perfect combo of salty and sweet, plus a few peanut butter cups for decoration. How could you say no???? I ended up photographing these beauties at 9 am, then promptly proceeded to eat the leftover peanut butter frosting and a very large brownie. Approximately 60 minutes after eating my breakfast. So to say that they were a huge hit in my book – is probably a bit of an understatement. If you don’t feel like reading recipe specifics – you can Click Here . But for some baking science – let’s get to it. This brownie recipe is an easy, one bowl kind of deal. It’s made with melted butter for more flavor, and cocoa powder for a not too rich but deliciously chocolate-y taste. (And also because it’s less ingredients to buy at the grocery store). And finally, being careful not to bake too long – about 22-24 minutes total. 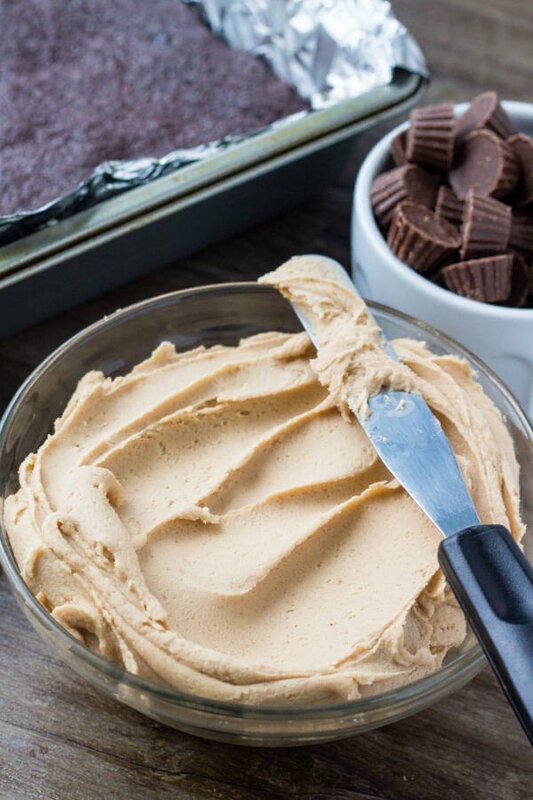 After the brownies are baked and cooled – it’s time to make the peanut butter frosting. You can pop the brownies in the fridge to cool them quicker, or usually I make the brownies the night before and then frost them in the morning. The peanut butter frosting is salty, sweet, creamy, fluffy deliciousness. First beat together the butter and peanut butter (if there’s a few lumps at this point – that’s ok). Then beat in the vanilla extract, salt & slowly add in the powdered sugar. If the frosting seems too thick, add in a little milk or cream and you’re good to go. The recipe makes enough frosting that you’ll have a very thick layer on your chocolate peanut butter brownies – which is a very good thing. Then I topped mine with chopped peanut butter cups (the mini ones), and a drizzle of melted chocolate. I’m such a big fan of peanut butter and chocolate – and I LOVED these peanut butter chocolate brownies because they’re big on flavor without being crazy rich. Obviously they’re decadent, but the saltiness of the peanut butter frosting really evens out the sweetness factor. What’re your favorite peanut butter & chocolate treats? These chocolate peanut butter brownies start with an easy, one bowl fudgy brownie recipe. Then they're topped with creamy peanut butter frosting, peanut butter cups and a drizzle of chocolate. Preheat the oven to 350F degrees. Line an 8x8 inch pan with parchment paper or aluminium foil and grease lightly. In a medium bowl stir together the butter and cocoa powder. Whisk in the sugar, eggs and vanilla extract. Gently fold in the flour and salt. In a medium bowl beat together the butter and peanut butter. Beat in the vanilla extract, then slowly beat in the powdered sugar. If it seems too thick, beat 1 to 2 tablespoons of milk or cream. Frost the cooled brownies. Sprinkle with chopped peanut butter cups and drizzle with melted chocolate. * Brownies can be stored at room temperature in an airtight container for 3 days, or in the fridge for 4 days. 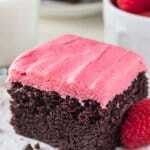 **Unfrosted brownies can be wrapped tightly and frozen. Thaw overnight in the fridge. It’s definitely my favorite combo – I hope you love the brownies!